Like most of Nikon’s optics the P-223 performs with a superiority that only Nikon can claim. Coated with their patented glass treatments the P-223 has an impressive 98% light transmission. The scope has a zero-reset feature that makes sighting your target easier than ever; even with repeated recoil. There is also a virtual parallax free shooting experience up to 100 yards. Nikon went through all the steps to make sure that marksmen mounting this scope would enjoy their shooting experience. Even though the Nikon P-223 is designed to shoot .223 REM or 5.56 NATO rounds, you can still find your sighting settings through Nikon’s Spot On website. Spot On was designed for those that need to adjust their sights for higher powered ballistics. No matter what you load, Nikon P-223 will allow you accurate sighting with the use of their Spot On smart phone application (or website). With all the features that this scope has, it is no wonder that Nikon frequently has this scope on back order. It is one of the better scopes available at the price-point. Look at the technical specifications overview, then we will lay out all the features in more detail. ​CLICK NOW for more info on Amazon.com! The Nikon P-223 features a BDC carbine reticle. The reticle is designed to be used with the .223 or 5.56 ammunition. Adjustments for different ballistics can be made either with the turret or through the Spot On website. Either method will have you clustering your target with ease. Click below to get the lowest price for the best red-dot sight on Amazon! The BDC carbine reticle featured on the P-223 offers a reticle mark for 200 yd. There are also hash marks showing where the 400 yd. and 600 yd. shots will hit. The targeting system in the BDC carbine reticle makes it an ideal scope for the medium range marksman. The circles inside the reticle are easy to read and allow you to adjust your aim for bullet drop easily when using the standard .223 or 5.56 NATO ammunition. The hash marks are readily detectable and it makes for quick target allocation with accurate sighting. There is only one zoom on the Nikon P-223 scope. The 3x magnification allows you to see a moderate distance with little difficulty. The 3x zoom has a field of view of 35.6 feet at 100 yards, allowing you generous space to sight the target. The multiple coatings on the glass for the P-223 by Nikon allow this scope to have a 98% light transmission. There is not built in target illumination on the reticle. However, the way that the P-223 is set up allows for easy target acquisition. The parallax of the Nikon P-223 is set to 100 yd. and is not adjustable. Making the corrections for your parallax free shooting will be all on the shooter and how they sight their target. Compared to other scopes that are parallax adjustable from 15 yd to infinity this is one area where Nikon dropped the ball. ​Good cheek weld should allow you to shoot relatively parallax free. However, those who often shoot at elevated positions may find that the lack of a parallax setting means that their shots hit a bit off target. The Nikon P-223 turrets are designed with high visibility markers that make it easy to adjust your sights. The zero-turn reset feature available on the scope allows for easy adjustment. All you need to do is lift the spring-loaded knob and adjust your sights back to zero. There is precise ½ inch hand turn adjustments on the turret systems for this scope. The positive click reticle adjustments allow you to get zeroed on your target quickly and easily. One of the greatest selling features of the Nikon line of scopes is the no-fault repair and replacement policy. This replacement policy allows for total customer satisfaction. Any repairs that are not covered by the limited lifetime warranty can be sent to Nikon to be repaired or replaced at no charge. Having a scope that will get replaced even beyond the warranty can lend many years to the scopes value. Not only is there a lengthy warranty, but the built-in features on the P-223 scope allow it to be a versatile scope. The scope is nitrogen filled and sealed with an O-ring. This feature makes it both waterproof and fog proof. The nitrogen filled scope allows fog free sighting in many environmental conditions. The O-ring seal ensures that neither the nitrogen will leak out or water will seep into the scope. These features add usefulness to this already useful scope. This scope is lightweight and compact. The Nikon P-223 only adds a little over 12 Oz to the total weight of the weapon. That is a nice comparison to other heavier scopes. It also a slim profile at just under 8.5 inches. The slender look of the Nikon P-223 isn’t overcome by the width and height of the glass either. The objective lens is just 32 mm. The small size of the lens doesn’t impact the performance. The P-223 gives you everything you would expect from a moderate range riflescope. As with every scope on the market there are features that you enjoy and features that you wish would be improved. The Nikon P-223 is no different. There are several great features on this scope that make buying it an easy decision. However, a few aspects of this scope may make it problematic if you have a particular shooting style. Multi-coated glass allowing 98% light penetration makes low light shooting possible. BCD reticle has demarcations for standard ballistic ammunition at multiple distances. Satisfaction guaranteed warranty beyond the limited lifetime warranty. Nikon Spot On website for access to ballistics variations and settings on the BCD reticle. The 100 MOA adjustment is almost unheard of in scopes. Typical internal adjustments cap out at 60. Take advantage of this generous internal adjustment. No target illumination on the reticle. If you’re looking for a compact riflescope, the Nikon P-223 3x32 is a great option. 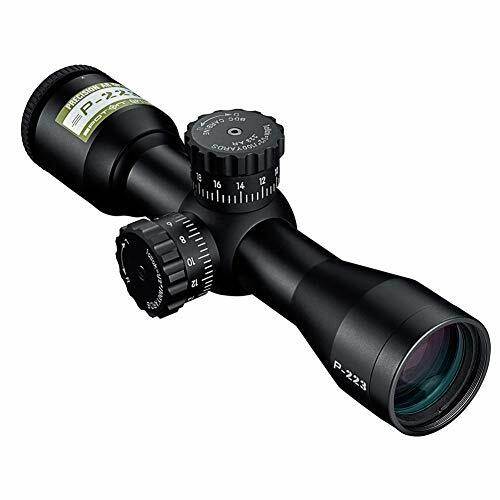 This riflescope is lightweight and provides you with excellent magnification and light transmission. Though there is no target illumination on the BCD reticle, the light transmission makes this scope operable in most shooting settings. The small size is a huge selling point for people who don’t want to add a huge objective lens to their rifle. The weight of larger scopes can be difficult to adjust to for some marksmen. That isn’t a worry for the P-223 because it weighs in well under 1-pound. The nitrogen fill on the scope ensures that you are going to have fog free targeting. O-ring seals not only keep the nitrogen on the inside it also keeps the water on the outside. There is nothing better than the crystal clear view that you get through the Nikon P-223 3x32 scope. There aren’t many downsides to getting the Nikon P-223. However, marksmen who are used to being able to adjust their parallax are not going to be satisfied with the fixed parallax on the Nikon scope. Are Red Dot Sights Useful In The Dark? Monocular Vs Binoculars - Which Are Better? RifleScopesCenter.com is a participant in the Amazon Services LLC Associates Program, an affiliate advertising program designed to provide a means for sites to earn advertising fees by linking to Amazon.com.